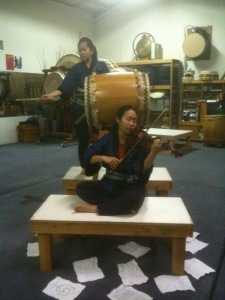 Bob Hicks visited a collaborator meeting with Portland Taiko for new works to premiere this June. Here are some of his thoughts in an article called Ten Tiny Taiko Dances: The First Steps. Byron Au Yong, the Seattle composer who’s worked with Portland Taiko before, arrives with a score already in hand. He passes copies around the circle: it’s elegant, intricate notation.